Back in February 2017, KFC created an elaborate online prank to promote its latest Dirty Louisiana burger with a fake food blogger and a humorous take on the clean eating craze. The fast food chain worked with agency BBH to challenge the indifference much of the audience had displayed towards previous social campaigns. Through the use of data BBH found an online phenomenon – "clean eating" – and uncovered an insight within that phenomenon: it is increasingly seen as joyless. With that in mind, KFC could could join in and disrupt a highly relevant conversation its target audience was having. The agency started by creating a KFC Crave Index. This looks at the total number of people ‘craving’ KFC on social media and divides it by the total branded conversation. The KFC Crave Index was showed a surge in the early months of 2017. Almost 7% of the entire KFC conversation revolved around craving KFC. On further investigation, it became clear that people who were talking about ‘clean eating’ were the primary drivers. 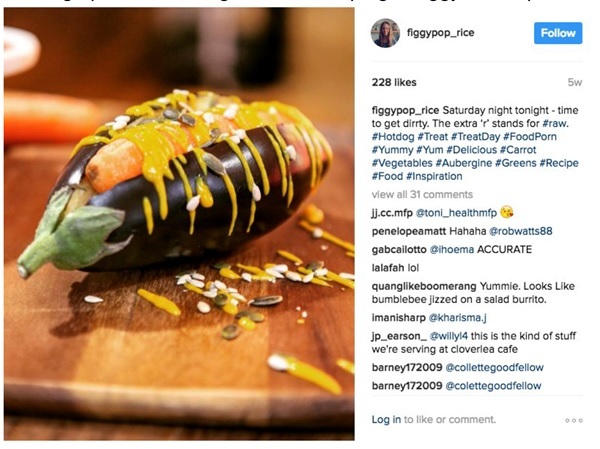 BBH created not a fake burger, but also a fake food blogger: Figgy Poppleton-Rice with 40,000 fake followers. It created a presence for her on social platforms, as well as a fake book, and posted large amounts of content before the campaign started. This level of detail helped further the conversation and resulted in publications such as Marie Clare reaching out to ‘her’ for interviews. to launch a fake burger in collaboration with KFC. BBH gave her a social presence on Instagram, Twitter and a blog. In keeping with other online influencers, it decided to invest £120 to increase her social credibility – garnering 40,000 followers across these channels. Leading up to and throughout the campaign, Figgy would post endless ‘clean’ recipes. She also offered lots of dubious lifestyle tips and, in true Instagrammer-food blogger style, she had her own recipe book – "A Feast With Figgy". 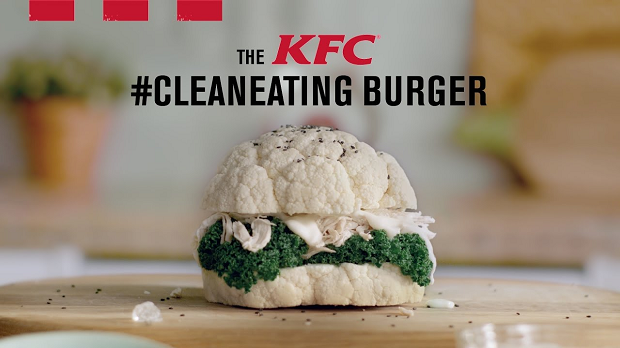 BBH followed this up with the launch of the KFC "clean-eating burger" a cauliflower bun, spiralised chicken, almond yogurt, ice-cube relish and other goodies. Within 48 hours, the single image reached more than 12 million unique people in the UK, with just £5,000 media spend. Over 160,000 people had expressed their disgust about KFC’s latest burger. In the same time frame, Figgy Poppleton-Rice became a superstar, accounting for 21% of all Google searches to do with "clean eating". Five days after the reveal, BBH the published the two-minute video showing Figgy the ‘clean burger’. The final reveal is a massive poster of the actual burger, the Dirty Louisiana, that comes down and smashes the Figgy’s burger. The viral quickly became KFC’s most watched video ever, quickly racking up more than 10 million views, and reached more than one-third of the UK. Furthermore, over 250,000 people commented on the Facebook video alone. The video received significant press coverage with news outlets all over the world and the campaign had a unique reach of more than 27.8 million globally. The Dirty Louisiana became one of KFC’s bestselling LTOs (Limited Time Offers) of the past five years, selling out of 70% of stores nationally within three weeks and surpassing its sales mix target by 39%. KFC even brought the burger back in July, marking one of the fastest returns of an ‘limited time offer’ product in KFC UK’s history. The fake burger created a massive social conversation with 350,000 people mentioning the campaign – the majority in comments on the two Facebook videos. The video generated more than 22 million views in total, which people collectively watched for 9.5 million minutes, meaning a watch-time of 18.5 years. KFC owned 67% of the UK search interest in ‘clean eating’ over the course of the campaign spikes, according to Google data.